Numerous prior posts have highlighted various aspects of the DOJ’s Foreign Corrupt Practices Act “pilot program” announced earlier this month. To be clear, this post does not advocate or even imply that the corporate community should ignore the pilot program. After all, the DOJ has extreme leverage over business organizations subject to FCPA scrutiny and it is always wise to at least be cognizant of what an adversary possessing a big and sharp stick is saying. Nevertheless, absent limited circumstances not often present in instances of FCPA scrutiny, how to respond to internal breaches of FCPA compliance policies is a business decision entrusted to those charged with managing the business organization. In exercising this business judgment, the corporate community should take the pilot program with a grain of salt for at least six reasons. The second reason why the corporate community should take the pilot program with a grain of salt is perhaps obvious, but bears repeating: the DOJ is an adversary. Imagine a business organization facing an adversary in other legal actions and the adversary states that it “may” or “will consider” a lower settlement amount should it prevail if the business organization acts according to the adversary’s discretionary commands. 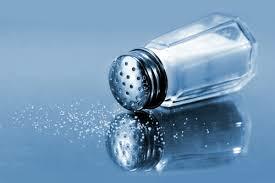 The third reason why the corporate community, at least so-called issuers under the FCPA, should take the pilot program with a grain of salt is that it is an incomplete program because issuers are subject to FCPA enforcement by both the DOJ and SEC but the pilot program is a DOJ program only. To be sure, just like the DOJ, the SEC has long encouraged voluntary disclosure of FCPA violations coupled with repeated assurances that voluntary disclosure will in meaningful credit. However, unless and until the SEC articulates a similar FCPA program (a program that will likely suffer from the same deficiencies as the DOJ’s program), the DOJ’s FCPA pilot program addresses only half of the enforcement landscape facing issuers. The fourth reason why the corporate community should take the pilot program with a grain of salt is that the DOJ’s statement to perhaps reward voluntary disclosure with meaningful credit is nothing new. As extensively highlighted in this prior post, the DOJ has been saying the same thing for over a decade. The fifth reason why the corporate community should take the pilot program with a grain of salt is that the DOJ’s statement to perhaps reward voluntary disclosure, cooperation and remediation through specific percentage reductions from the minimum amount suggested by the guidelines is also nothing new. This prior post proves, using the DOJ’s own numbers, that there have been numerous instances, prior to the pilot program, in which the DOJ has resolved corporate FCPA enforcement actions using the same thresholds it “may” use going forward. Sixth, and perhaps the biggest reason, why the corporate community should take the pilot program with a grain of salt is that it only addresses a relatively minor component of the overall financial consequences to a business organization the subject of FCPA scrutiny and enforcement. For obvious reasons, settlement amounts in an FCPA enforcement action tend to get the most attention. After all, settlement amounts are mentioned in DOJ / SEC press releases, press releases generate media coverage, and the corporate community reads the media. However, knowledgeable observers recognize, as depicted in the below picture, that FCPA scrutiny and enforcement results in “three buckets” of financial exposure to a business organization. (To read more about this dynamic, read this article “FCPA Ripples.”). In nearly every instance of FCPA scrutiny and enforcement, bucket #1 (pre-enforcement action professional fees and expenses) is the largest financial hit to a business organization. The reasons for this are both practical and potentially provocative. In term of the practical, all instances of FCPA scrutiny have a point of entry, for instance problematic conduct in China, that then results in the “where else” question from the enforcement agencies which often prompts the company under scrutiny to conduct a much broader review by the organization under scrutiny. In terms of the provocative, FCPA scrutiny can easily become a billing boondoggle for FCPA Inc. participants. A couple of specific examples highlight how extensive pre-enforcement action professional fees and expenses can become. For instance, Avon resolved an FCPA enforcement action for $135 million in aggregate DOJ and SEC settlement amounts, but disclosed approximately $550 million in pre-enforcement action professional fees and expenses (a 2.5:1 ratio compared to the settlement amount). Likewise, Bruker Corp. resolved an FCPA enforcement action for $2.2 million, but disclosed approximately $22 million in pre-enforcement action professional fees and expenses (a 10:1 ratio). Perhaps most eye-popping, Hyperdynamics resolved an FCPA enforcement action for $375,000, but disclosed approximately $12.7 million in pre-enforcement action professional fees and expenses (a 170:1 ratio). Yet here again, the DOJ has been highlighting the excesses of FCPA internal investigations (and pointing the finger at FCPA Inc. and not itself as the root cause) for years prior to the pilot program with no observable impact. In addition to not meaningfully addressing bucket #1 pre-enforcement action professional fees and expenses, the pilot program also does not meaningfully address bucket #3 post-enforcement action professional fees and expenses. Sure, the pilot program does state, consistent with the DOJ’s prior rhetoric on the issue, that voluntary disclosure, cooperation and remediation “generally should not require appointment of a monitor.” But even FCPA enforcement actions resolved without a monitor typically require reporting obligations by the business organization to the enforcement agencies and in some cases “enhanced compliance obligations” complete with audits. 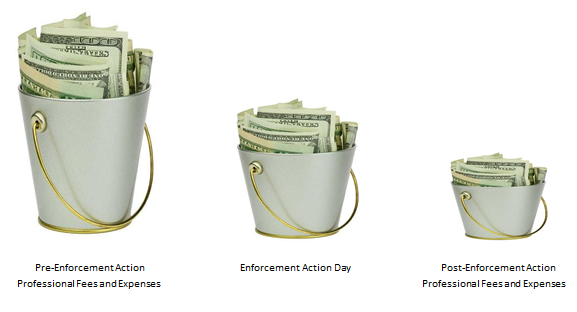 While bucket #3 is the smallest of the “three buckets” of financial exposure, post-enforcement action professional fees and expenses, even in garden variety FCPA corporate enforcement actions, often exceed millions of dollars per year for the one to three years of the requirements. The corporate community needs to fully understand and appreciate that the pilot program only addresses a relatively minor component of the overall financial consequences that typically result from FCPA scrutiny and enforcement. Related to this key point, is the fact that a company (particularly an issuer) subject to FCPA scrutiny and enforcement will often also experience several other negative financial consequences above and beyond the “three buckets” of financial exposure. Such financial consequences often include a drop in market capitalization, an increase in the cost of capital, a negative impact on merger and acquisition activity, lost or delayed business opportunities, and shareholder litigation. In certain cases, these other negative financial consequences can far exceed even the “three buckets” of financial exposure discussed above. In short, corporate leaders need to fully understand and appreciate (in addition to the specific topics discussed above) that a voluntary disclosure of potential FCPA violations is going to set into motion a wide-ranging sequence of events that will be far more costly to the company than any marginal benefit obtained through the pilot program’s non-binding promise of a reduced settlement amount. (Recall that under the pilot program, even if a company does not voluntarily disclose it may receive a 25% credit off the minimum amount suggested by the guidelines if it cooperate and remediates). No doubt there are some who are likely to respond along the following lines: if a business organization does not voluntarily disclose FCPA violations, it is likely that the enforcement agencies will independently find out about the violations and when this happens the company is going to experience the same negative financial consequences highlighted above plus, because of the lack of voluntary disclosure, a larger settlement amount. However, this line of reasoning represents pure speculation. Recognize that the following is anecdotal and not offered to establish the truth of the matter asserted. However, I have been actively involved in the FCPA space for approximately 15 years both as a lawyer in private practice who conducted FCPA internal investigations around the world and in other professional capacities. To my knowledge, never once did the DOJ independently find out about the underlying conduct and in speaking to other FCPA practitioners about this precise topic, it has never happened to their clients either. Notwithstanding the many shortcomings in the pilot program, going forward there no doubt will be companies (perhaps persuaded by FCPA counsel eying lucrative billings that flow from voluntary disclosures) that choose to voluntarily disclose FCPA issues in the hopes of being “rewarded” under the pilot program. Certain commentators are likely to then proclaim the pilot program a success. However, this line of reasoning completely misses the point that business organizations were often voluntarily disclosing prior to the pilot program. Rather, the key issue to track is whether the pilot program is motivating voluntary disclosure of potential FCPA violations that did not occur prior to the pilot program. It will be impossible to empirically measure this issue. Likewise, it will be difficult (if not impossible) to assess whether the DOJ is acting consistent with the pilot program for the reasons discussed above regarding how the final sentencing guidelines amount is the product of and contingent upon several less than transparent discretionary calls made by the DOJ earlier in the sentencing guidelines equation.